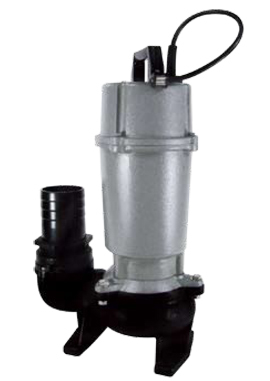 BV Series – semi-vortex sewage pumps, unique non-clogging design suitable for carrying heavily polluted waste water containing grass, sand, stones, and etc. Outlet – 40 mm (1 1/2 in. ), 50 mm (2 in. ), and 80 mm (3 in.). 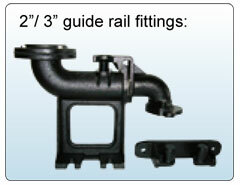 Cast iron construction – superior heat dissipation. Heat treated 410 stainless steel shaft. Double mechanical seals (lower silicon carbide V silicon carbide, upper carbon/ Ceramic) in oil chamber. Dynamically balanced vortex impeller – vortex effect to carry soft or fibrous materials without clogging. Oil-free motor, 1 & 3 phase, with thermal & overcurrent protector. Class F insulation, IP 68 protection motor. Max. liquid temperature: 40°C (104°F). Standard cable: 6 m (20 ft.) or longer upon request. Tethered float switch is available: BV-153A, ..., BV-315A.